Looks like I'm minority here. 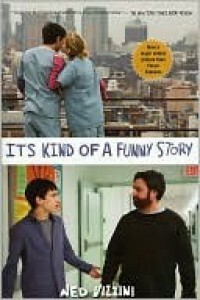 I found that I didn't enjoy It's Kind of a Funny Story and I didn't find it funny it all. I didn't like the writing style either. Despite that, I liked reading Craig's therapy sessions because it pricked my curiosity. I wanted to know what thoughts he'd reveal to the shrink because to me, mind is a mystery. It's like it's an interesting, challenging puzzle. I picked this book because depression is nothing new and I experienced it worst back then during high school. High school's tough. And I thought reading this, thing would be expected is mixed angst and fun. Oh well, I didn't get that and more's like bland. Also, reading this for the author's tribute, RIP Ned Vizzini.